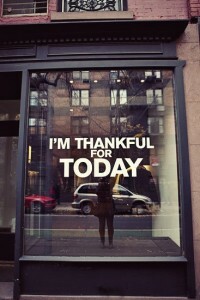 I have come to realise that I could be a whole lot better at being thankful. I am good at minding my P’s and Q’s but I am not very practised at noticing all the good things in my life. Last night at the Rev’s members meeting we were given the opportunity to reflect on what we were thankful for. I couldn’t believe how quickly so many blessings came to my mind. As I wrote them down, my heart swelled and as I took a deep satisfying breath, in and out, I felt like life got a little more perspective. There are so many things in life to be thankful for. For being alive. For being free. For having enough. For being loved. For being worth enough that God sent his son to die for me. As my thoughts became more specific, I thought back over the last year and about all the blessings that have been bestowed upon me. All the promises that have been fulfilled. All the ground that has been gained in battles against insecurity and brokeness. It took me back to my second year at Uni. I was huddled in my room trying to warm up next to the radiator. I felt more than a little lost. I needed God to make Himself known and as I opened my Bible pleading for some guidance, the words Isaiah 62 came to my mind. I didnt know the verse and as I flicked through the pages, I though I was crazy to think anything meaningful would come from it. But as I read the words, tears came to my eyes. These words resonated deep within my soul. It was a promise that there would be growth in who I was. That there would be healing and connection in my future. There would be marriage. There would be joy. There would be many things to be thankful for. Eight years later, this promise is well on its way to being fulfilled. As I look back over the last year alone, there has been so much restoration. God has restored me. He is restoring me. And I am sure He will keep on doing so. And the only thing I can do is to fall on my knees in thankfulness. God has graciously poured out gift upon gift and I want to have a grateful heart in response. I am thankful for Gods comfort and presence in my life. For my husband who looks after me and is my greatest champion. For my family and all those who are included in that phrase. For my lifegiving friends. For a restored relationship with my sister Sarah who is becoming more like a best friend. For a job I love. For my students who make my life worthwhile. For small victories that come in many shapes and sizes. For the unique and diverse community I am part of. For my colleagues who keep me going each day. For my gorgeous nephew Toby who I adore. These are just some of the things I am thankful for. Some of these I never thought would come true, somethings I never thought I could be. And although I am undeserving, God continues to bless me and restore me and fulfill so many of my hopes and dreams. And all I can be is THANKFUL.